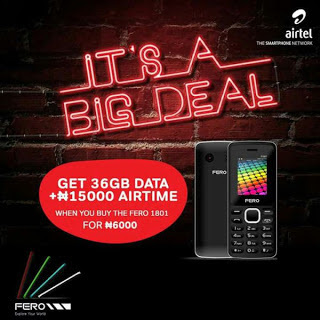 Airtel is currently running a promo that will give users the chance to get 36GB of data plus a whooping N15,000 airtime when you buy a Fero 1801 phone for just N6,000 only. Activating the data and airtime is quite easy and considering the fact that the network coverage is almost in all locations nationwide. It's sure a big deal to go for. Locate any nearest official Airtel store around you, or find one nearest to you Here. That's all, very easy and simple. I have a trick to get the data and airtime on non-Fero 1801 phone only if I can get hold of the IMEI and tweak it on my phone. If you have bought this phone or know anyone that is currently using the phone, kindly help us get the IMEI number so we can tweak it into our phone to be eligible for the offer. Kindly comment below and share this post with your friends.